Having had such a bounty of beetroot at our allotment again, I’ve been experimenting with sweet as well as savoury dishes. This creation was a real quickie I discovered with some leftover cooked beetroot we had in mash the other day. I was about to put it into a chocolate brownie mixture as that was the obvious thing to do but my husband was checking on his sloe port and I thought some boozy truffles might make for a lovely after dinner treat. And they really did. We watched Downton, sipped on port and pretended to be sat in the elegant drawing room being served by Carson. Perfect Sunday night. Purée the beetroot until there are no lumps. Meanwhile boil some water in another small saucepan, turn down to simmer and place a heatproof bowl on top. Break your chocolate into small pieces and pop into the bowl. Leave this to melt and then cool slightly. When the purée has thickened – this could take about 10 minutes – and cooled, stir this into the melted chocolate. Leave this mixture to cool completely. Put a few tablespoons of cocoa powder into a cereal bowl or dinner plate with curved edges. 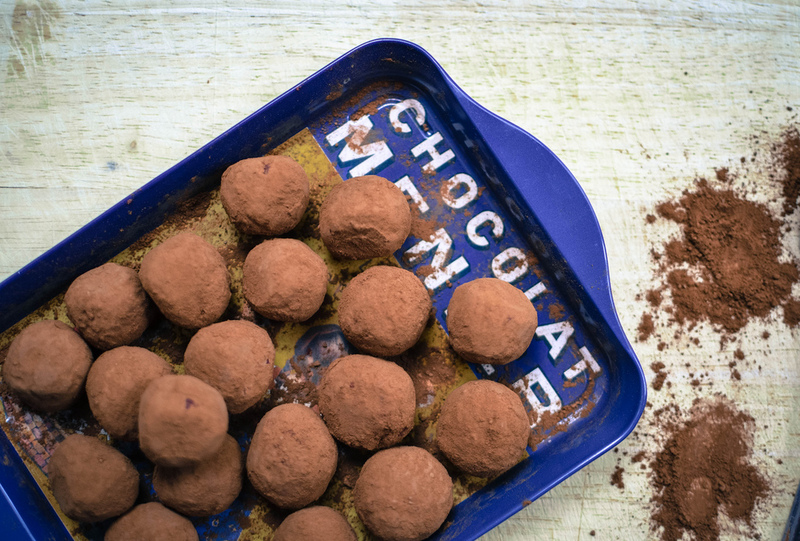 When the beetroot and chocolate mixture is cool, take a small lump and roll this into a ball. Pop the ball into the plate of cocoa powder and toss it around a little by shaking the plate to coat it all over. Repeat the last two steps with the rest of the mixture. You may need to give the balls a few coatings depending on how wet your mixture was. If you’d like to add alcohol to the mixture do this to the beetroot purée and let it cook down. I tried about 4 tablespoons of my husband’s sloe port and this gave a very boozy taste. The alcohol does cook off a little but you can experiment to find your perfect combination. Red wine would also work. As lovely as they were I think they’re a little rich to have everyday but would make a perfect Christmas present. 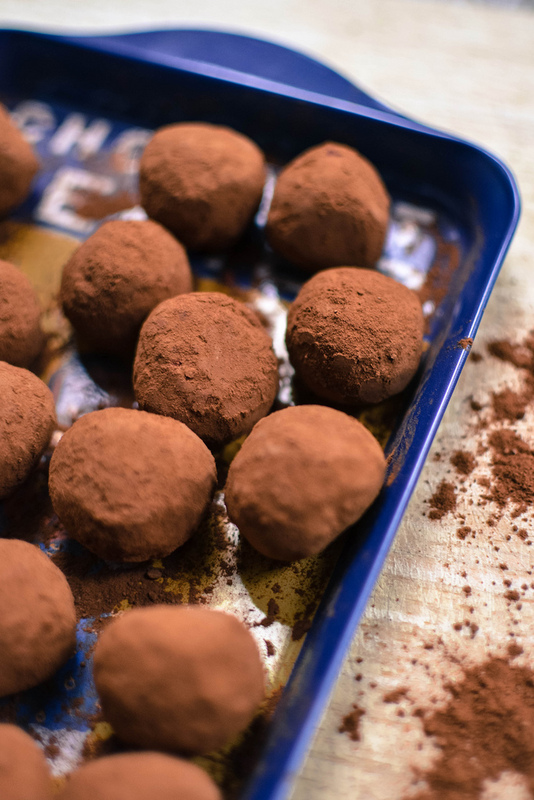 I’d say they’ll keep for a week or so in the fridge like most other truffles and instead of the cocoa you could roll them in nibbed hazelnuts, edible glitter or even chocolate strands. Previous Post: « More Kale Please! Now this one I will definitely try and I don’t even have a glut of beetroot! What a clever idea, I love it! Healthy chocolate truffles 😉 who knew. Am so excited to try these!!!!!!!! I’ve really enjoyed beetroot in chocolate cakes and brownies so can see it would work just as well in truffles, lovely idea, Urvashi! Love this idea, I bet they taste sublime! Great for a healthy twist. Booze and truffles are two of my favourite words. I love that you have used beetroot too, I bet that gives them a really nice texture. Yes the texture is lovely. Doesn’t stick to the roof of your mouth like other truffles. Omg I am making these for Xmas for sure!! Sounds simple AND delicious! Thanks! Can’t believe that these are made with beetroot! They look heavenly! I am absolutely loving the sound of these! Yum!